Suzanne Norman, wellness and mind/body expert, has been empowering clients and students to tap into their own innate healing powers for 15 years through her Enlightened Living http://www.enlightenedlivingonline.com programs. Norman announces her newest online training program, “The Healer Within,” which develops personal skills for self-healing. The online course launches in conjunction with a Special Screening, hosted by Norman, for “HEAL,” directed by Kelly Noonan Gores. The documentary features leading scientists and teachers—from Deepak Chopra, Marianne Williamson and Gregg Braden to Dr. Joe Dispenze, Anita Moorjani, Dr. Bruce Lipton and Dr. Darren Weissman. The event takes place at The Improve Playhouse Theater located at 735 N. Milwaukee Ave., Libertyville, IL., with a Live Q&A with Dr. Weissman, immediately after the screening. “HEAL” takes us on a scientific and spiritual journey where we discover that by changing one’s thoughts, emotions, and perceptions, the human body can heal itself from any dis-ease. 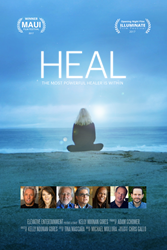 “HEAL” not only taps into the brilliant minds of leading scientists and teachers like Chopra, Dispenza, Moorjani, and Lipton, amongst many others—it also follows real people on actual high-stakes healing journeys. This self-healing theme perfectly aligns with Norman’s own beliefs and teachings and have helped hundreds of her clients and students over the years. “The Healer Within” online course takes students on a journey of exploration into the power of the mind. It is intended to teach the skills of mental training to direct the body’s healing abilities. This is a course that consists of over eight hours of lecture, research, and practice via video and audio learning. It can be accessed through Enlightened Livings website at http://www.enlightenedlivingonline.com and the cost is $129.00. Like Norman’s course, the documentary’s intention is to help people discover that thoughts, beliefs, and emotions have a huge impact on health and the ability to heal. The latest science reveals that we are not victims of unchangeable genes, nor should we buy into a scary prognosis. The fact is we have more control over our health and life than we have been taught to believe. This film empowers people with a new understanding of the miraculous nature of the human body and the extraordinary healer within us all. Healing can be extremely complex and deeply personal, but it can also happen spontaneously in a moment. Through these inspiring and emotional stories, we find out what works, what doesn't, and why. Chicago-based Dr. Darren Weissman, who appears in the film, will be joining Norman at the screening for a post-viewing Live Q&A discussion. Please visit http://www.enlightenedlivingonline.com for more information. Suzanne Norman, aka "the mind hacker", is a mind/body health expert and woman’s empowerment coach who founded the company Enlightened Living LLC in 2002. With two decades of experience helping thousands of people enlighten their minds and heal their bodies through her programs and courses, Suzanne helps people take control of their wellness and live exceptional lives. Norman has a background in the natural health sciences with training in the yogic sciences, holistic nutrition, and clinical hypnotherapy. She is a traditional Naturopath and her specialty is mind/body medicine. Norman provides profound personal insights and creative integration tools and strategies to help create a conscious, successful, purpose-filled life. Her newest online program, “The Healer Within” is available in December 2017. Norman has over twenty years experience in the fields of complementary and alternative therapeutic practices and personal development. With extensive experience and knowledge in multiple healing modalities as well as her special skill in subconscious mental training for permanent change, she has worked with high-level individuals and groups to transform health, by pinpointing and dissolving the limitations keeping them from reaching goals. Norman's goal is to empower one million people to take control of their health and wellness by mastering their mind.